Artists pictured above (L to R, from top to bottom): Gate City Divas, Bio Ritmo, Tom Principato, The Poetry Cafe and Abyss & Uprite Lions, Carolyn Malachi, Greensboro’s Ode to Sister Rosetta Tharpe, The Piedmont Triad Jazz Orchestra, The Suffers, Diali Cissokho & Kaira Ba and The Broadcast. This eight-woman funk, R&B and blues outfit brings a vast amount of talent, a larger-than-life stage presence and a deep love for their hometown of Greensboro, N.C. The lively rhythms of Latin dance band Bio Ritmo will have audiences up off their feet, dancing to experimental salsa. Seasoned Washington D.C. guitarist and singer Tom Principato fills the air with his catchy blues vocals and driving guitar riffs. This evening of music and poetry, led by poet, educator and entertainer Josephus III, will move and delight audiences. Join Greensboro’s finest musical talents in celebrating the life and musical legacy of pioneering African-American gospel singer and guitar virtuoso Sister Rosetta Tharpe. This cross-generational big band upholds the tradition of musical greats like Ellington, Basie and Gillespie while bringing in their own unique flavor. 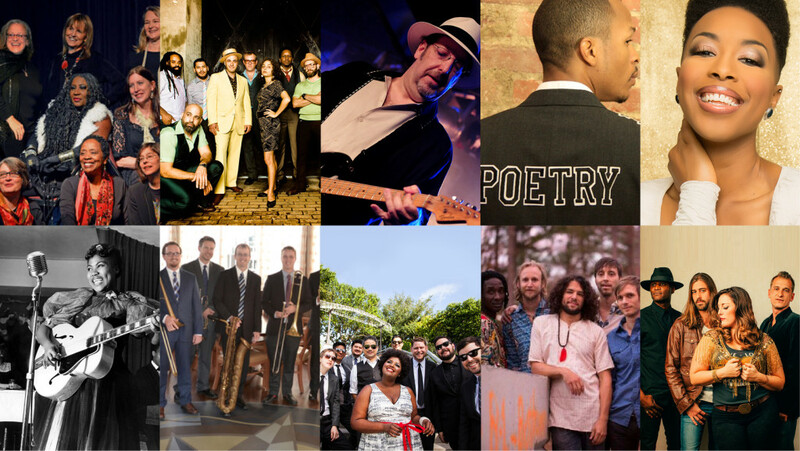 These veteran Levitt AMP Music Series performers will have audiences up off their feet dancing to the infectious rhythms of their unique brand of Gulf Coast Soul. Journey to West Africa through the euphoric grooves of this funk, soul and rock fusion group nominated “Best African Group” at the All Africa Music Awards. Described by audiences as a modern day “Grace Slick meets Led Zeppelin,” local North Carolina band The Broadcast adds an explosive twist to old school rock ‘n’ roll. This entry was posted in Levitt AMP and tagged Levitt AMP Greensboro on April 6, 2016 by Nicole McGaffey.